Gutierrez has now embarked on his latest campaign: to secure quick passage of the DREAM Act, which would legalize undocumented youths who attend college or serve in the military. With a Republican takeover of the House imminent, the lame-duck session of Congress offers the last chance (for a while, at least) to get it done. It won’t be easy, given the noxious atmosphere in Washington. Yet Gutierrez has already launched a nationwide tour of churches to rally immigrants and their supporters, and has begun rounding up votes in the House. Two weeks ago, he and a few other lawmakers met with Obama at the White House. “We want you to put everything you can behind this,” he says they told the president. Obama agreed to help—by, among other things, placing personal calls to wavering lawmakers. Gutierrez’s first stop on his church tour was St. Brigid’s in Brooklyn a week ago. Joined by Rep. Nydia Velázquez, chair of the Congressional Hispanic Caucus, and other elected officials, he was received with adulation by the hundreds of people packed in the pews. His speeches at events like these—delivered in a stentorian voice, despite his slight physique—resemble revivalist sermons. He started off softly, then crescendoed to ear-splitting decibels, jabbing his index finger toward the heavens. “The other side is waiting for us to get tired!” Gutierrez thundered in Spanish. “Is anyone here tired?” “No!” the audience roared back. That sentiment isn’t shared by many in the administration. 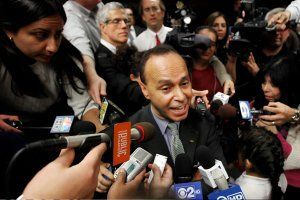 Gutierrez clashed repeatedly with Rahm Emanuel, Obama’s former chief of staff, whom he considered a prime impediment to an immigration overhaul. Another administration official, who didn’t want to be named to avoid exacerbating tensions, complains that Gutierrez “has contributed to the flawed impression that the president can do this by himself”—when, in fact, he depends on Congress to move legislation. “It saddens me … that [the president] and I have had these very public differences,” says Gutierrez. Still, Gutierrez has a track record of pragmatism, too. He took flak from some advocates for including strict enforcement provisions in an immigration bill he crafted with Republican Rep. Jeff Flake in 2007 (it didn’t pass). “He can go from being a bomb thrower to being a dealmaker,” says Angela Kelley of the Center for American Progress. “That’s a pretty important bilingual ability.” Gutierrez’s promotion of the DREAM Act is itself a compromise. Pro-immigrant forces agonized over whether to abandon the fight for a comprehensive bill in favor of a narrower one that would benefit only a slice of the undocumented population. In the end, they concluded that only the DREAM Act had a real chance. Gutierrez thinks the measure can prevail in the House. The bigger challenge is in the Senate, where Majority Leader Harry Reid has pledged to bring the bill to the floor in the next few weeks. Given the need for 60 votes to break a filibuster and the likely defection of a handful of Democrats, the measure’s backers need to win over at least a half dozen Republicans—a tall order these days. But seven current Senate GOP members voted for the DREAM Act in 2007, and a few others who are retiring aren’t considered hardliners. The immigrant movement will face a much more adverse climate in Congress next year. As a result, Gutierrez is trying to redirect its energy toward a different end: persuading Obama to use his executive powers to stop the deportation of law-abiding illegal immigrants. To ratchet up the pressure, Gutierrez is encouraging acts of nonviolent civil disobedience. “We cannot be a slave to the legislative process,” he says. “That’s what we’ve done, and it hasn’t served us very well.” Given that some Republican lawmakers have made clear they plan to use their newfound power to crack down even more on illegal immigrants, “the next couple of years are going to be an extraordinary battle,” says Rosenberg. Gutierrez’s “voice will be needed more than ever.” And you can be certain you’ll hear it.